Northern Virginia Gastroenterology P.C. (Centreville) - Book Appointment Online! Dr. Nisha Chand attended Eastern Virginia Medical School for her internal medicine training and chief medicine year in internal medicine. She later completed her Gastroenterology Fellowship at Virginia Commonwealth University where she was chief fellow as well. 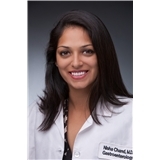 She is board certified in both Internal Medicine and Gastroenterology and Hepatology.